Kirby is back and this time he is making friends and bringing them with him on his newest adventure on Nintendo Switch. He will need to rely on the power of love and friendship if he is to save his beloved home Dream Land from a mysterious new threat. There are very few gamers in the world, that have not heard of the name Kirby. Created by the living legend Masahiro Sakurai himself. (You know, the guy that created Super Smash Bros.) when he was a young developer at HAL Laboratory. Even though Kirby is the creation of HAL Laboratory, he is revered as one of Nintendo’s most popular IP’s, just as much as Game Freak’s IP Pokémon is. The Kirby series has mainly focused on being 2D side-scrolling platformers that are easily accessible to novice gamers. Though each iteration of Kirby games has kept up graphically with the times, the gameplay has always maintained the same essence and has yet to venture into the third dimension. Much like Super Mario, Kirby has in fact, had his own spin-offs, including a golf game called Kirby’s Dream Course and another game called Kirby’s Pinball. Both games featured the spherical titular character as the ball which you had to navigate around the course or table in order to reach the hole or high score. Kirby is also a veteran fighter in the Super Smash Bros. series since the debut title on the Nintendo 64. The Kirby Series has also had its own twists and turns in the regards that its main antagonist, King Dedede, isn’t always the villain. Not in the way that there have been games that didn’t feature King Dedede but, that he was portrayed as a villain and believed to be the villain but turns out, that he actually has noble intentions to prevent a greater evil. King Dedede is the lesser of two evils I suppose. The same can also be said for another series veteran, Meta Knight. Another character that can be both a friend or foe depending on his role in each game. Kirby’s home Dream Land, is under threat by something known as the Jamba Heart. On the other side of the galaxy, the Jamba Heart is being used in some kind of ritual when it bursts and fires shards throughout the galaxy. Some of these shards find their way onto Planet Pop Star. The Jamba heart has the power to corrupt and transform anything that it comes into contact with. King Dedede and Meta Knight are just two of many that succumb to its dark power. Kirby awakes to see a terrible purple storm cloud over the top of King Dedede’s castle. It is now up to Kirby to make his way to the castle and find out what is exactly going on. I won’t beat around the bush, the game is beautiful graphically. It is crisp, clear and colourful and the visuals are just stunning. Whether playing in handheld mode or docked in TV mode, you are truly in for a treat. No one knows Nintendo’s hardware better than Nintendo so you will be very hard-pressed to find any kind of frame rate drops, which makes Kirby Star Allies feel even smoother, even if it does only run at 30 fps, which you hardly notice. The music in all other Kirby games has always been peppy & energetic and Kirby Star Allies is no different. You will find yourself moving with the music in no time as it penetrates your inner being and elevates you to levels of positivity you never even knew you had. The Music in Kirby Star Allies never gets old and you will be sure to hear the familiar tones from other Kirby games that have been revamped for a more, fresher take. The later Kirby games have all seemed to have a particular theme or gimmick. On the Wii, Kirby’s Epic Yarn featured a cardboard cut-out esque world where Kirby and enemies are made out of Yarn (this theme was also later used in Yoshi’s Woolly World, which got a more positive reception). Kirby and the Rainbow Curse for the Wii U focused on using the Stylus to draw paths for Kirby to roll across to get from different parts of terrain. The recent bout of Kirby games seem to focus on Teamwork and/or multiplayer like Kirby’s Battle Royale and Team Kirby Clash. Kirby Star Allies can be played alone with the help of CPU’s, or with up to three friends. Player 1 has to first befriend enemies, which can then be assigned to other players and then you must all work together to get to the end of each course. There are many different enemies, each with their own unique powers. As Kirby, you can choose to swallow and copy their ability or befriend them so that they join your team. Some characters can combine powers to boost their attack and be granted an extra effect like the flame sword for example. It combines the Sword ability with the fire ability, which allows the sword user to set things on fire as well. Kirby has the added advantage of taking on all abilities in the game. If there is an ability that you don’t like, just drop the ability you have and go and get another one. Should you inhale two enemies though, Kirby will be able to get a random ability as opposed to one that related to one of the two enemies he inhales. While not all enemies can be befriended, there are many that can be and are worth paying attention to. They may have powers that are necessary to overcome future obstacles and help solve certain puzzles that will help you go about getting Special Picture pieces. Should you accidentally kill an enemy you wish to befriend, go back on yourself until the position where the enemy once stood is off-screen and then return forward, the enemy should have appeared again. Being a platforming game, you can expect there to be plenty of platforms to hike up and down on. Kirby and friends also have an added bonus that they can float infinitely in the air without having to touch the ground (keep spamming A.) You can avoid quite a few obstacles like this and enemies too. This is handy for young children or novice gamers that are playing with more experienced players as they can avoid all the difficult obstacles and enemies and just flutter by. There are 40 stages across 4 worlds and 20 bosses that need to be put back in their place. You can power up with almost 30 different abilities that can be combined with other friends’ abilities to make a huge array of different combos, a lot of fun can be had which helps keep the gameplay from becoming too stale. 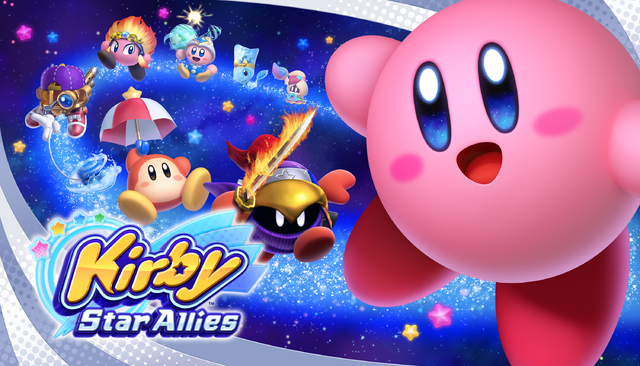 There are also a number of game modes for players to try their hand at, which offers different challenges to those that wish to extend their gameplay sessions with Kirby Star Allies. Of course, you can’t have a platformer without items to collect. There are mini stars dotted around every level. Once you collect 100, you will be granted an extra life. There are also puzzle pieces hidden in certain areas that when collected, are automatically added to puzzle boards. After the level is completed, the pieces will reveal artwork of the game. There are also special puzzle pieces limited to one per level that reveals a special artwork puzzle board. There are also secret Switches that will open secret stages. Should you require a hand, you can always use amiibo as 7 can be scanned per each stage, in the efforts to get more puzzle pieces and food items to restore health. If you fail to collect them all on the first try, you won’t be able to retry the level after completing it until you have finished the other levels and beat the final boss. Collecting all of the Friend Hearts in each level will unlock some extra special characters. The controls are very simple and responsive. You can play using a single Joy-Con, Joy-Con Grip or Pro Controller. Up to 8 Joy-Cons can be synced up to play by using 4 Joy-Con Grips. There is only a single attack button but there are plenty of varied attacks that can be done with it. By inputting a series of short button sequences like hold ‘Down’ on the joystick and pressing ‘B.’ When you tire of the main game, which will allow you to have King Dedede, Bandana Waddle Dee and Meta Knight join you, there are also mini-games. Granted you have to beat the main game to get all off them, but they are fun in their own right and will have you take on bosses in an arena, chomping down trees to make a house and even a mode just for friends. FYI, I hope you haven’t got anything against the word friend, as it will come up a lot! Kirby Star Allies is a very enjoyable romp that can be appreciated even more so with other players. It is an adorable platformer that is sure to be a welcome addition to anyone’s Nintendo Switch Library. For those looking for a challenge, you won’t find much of it in the main story. You will however, find it in The Ultimate Choice and Heroes In Another Dimension game modes. It’s a welcome sight for Kirby to be back on form on home consoles with gameplay anyone can get behind. Sure, it’s not the biggest game in the world as you can beat the story mode within 7 and a half hours and be at 75% completion, but it has a Super Mario 3D World vibe to it in more than one, which only makes the game more enjoyable. So, with the power of love and friendship, Kirby Star Allies will surely melt the coldest of hearts. Did you enjoy our Kirby Star Allies Review? If you would like to read more of our Nintendo Switch Reviews, feel free to check them out here. Well, given my friends and I usually do not get together to play games anymore, I guess I am making a good decision in skipping this one.